Separating mutual funds within one Vanguard account number. I have one Vanguard non-IRA account. How do I add new mutual funds to Quicken and keep them seperate from the other funds within that account number. Provided you established the Vanguard Brokerage account to contain more then one mutual fund, this should be easy. Assuming you download transactions from within Quicken, when you purchase a new mutual fund, Vanguard will send the new data in the transmission. Quicken will assign a buy transaction and list the new fund. My problem is that I added a new mutual fund account to Quicken. Because I already had one Vanguard account set up in Quicken, all the transactions for the new fund went into the existing Quicken account and not the new Quicken account. I can delete the new Quicken account and then account the new Quicken account. I need to know how setup the new Quicken account so I don't have that problem. My problem is that I added a new mutual fund account to Quicken. Because I already had one Vanguard account set up in Quicken, all the transactions for the new fund went into the existing Quicken account and not the new Quicken account. Isn't that the desired outcome? You have all mutual funds in a single Quicken account, right? This should mirror what is at Vanguard. If that's the case, then simply delete the new Quicken account. If not, please elaborate further as I can't follow the rest of your post. I'm confused too - your Quicken account list should mirror your Vanguard accout list. 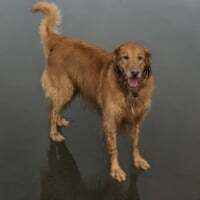 I have a Vanguard acct, with several mutual funds within that account. 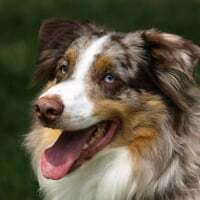 I also have a separate Vanguard acct for our son - different Vanguard ID, SSN, acct - and therefore it appears as a separate account within Quicken.... I just keep track of it. My Quicken does not mirror my Vanguard accounts. Previously I had two Vanguard no-IRA accts on my Quicken. I recently opened a 3rd Vang non-IRA acct. When I attempted to sync it with Quicken, the new acct transactions ended up going to one of first two accts. I noticed when I was in the process of adding the 3rd acct that Quicken could not only find one of the two existing acct during the process. It only saw one of the two acct. You have 3 Vanguard Brokerage accounts each containing one or more stocks/MFs. Quicken only has 2 Vanguard brokerage accounts each with one or more stocks/MFs. You are trying to add a third account in Quicken and this is where the problem is. I think we're on the same page. 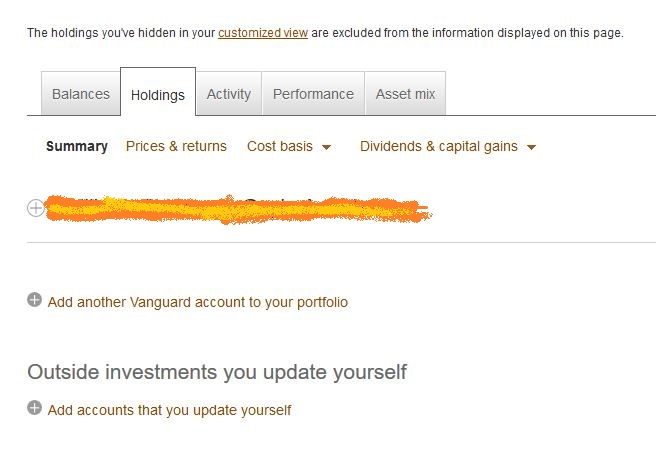 I have three non-IRA Vanguard accounts, all with the same account number. (They are differentiated with fund numbers.) Previously, I was able to set up matching Quicken accounts that sync with the Vang mutual funds.. However, when I set up the new and 3rd Quicken account and would it did not link with newest Vang mutual fund. Instead, the new Quicken Vang mutual fund acct. transactions went to one of the two old Vang Quicken acct. PS: I deal directly with Vang, I don't go thru' a broker. If they all have the same Vanguard account # they are all in one same Vanguard account. You just have different funds in that account. So do I. They all come on the same statement. Not so sure. 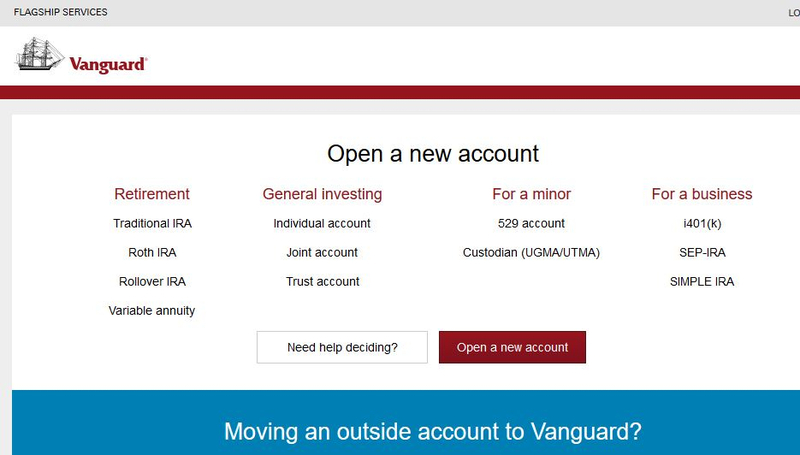 You say non-IRA accounts, if you log into the Vanguard site you should see Vanguard Brokerage account if it's not an IRA or 401(k). That's what I'm referring to. 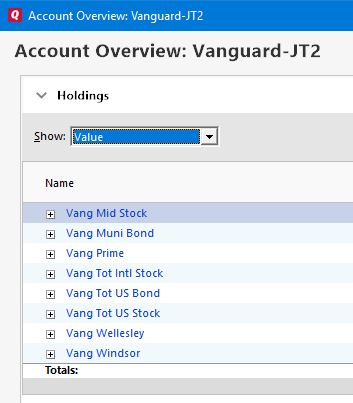 Can you take a screen shot of Vanguard with $ amounts and partial account numbers masked? I can't see how three accounts can have the same account number with differing fund numbers. I'm following the discussion, but really confused on what you are saying or wanting to do.. Vanguard is going to setup an overall account - and have funds or other brokerage elements within that single account. I just have mutual funds... Then you have a SSN and a User ID / password setup to access the Vanguard website and display your account. All of those things are bundled together as a single package. So, I'm confused on what you are describing with the "same account number" - but then having 3 different accounts... yeah, of course the funds inside are all different, but they all exist under the single Vanguard account. It sounds like you are conflating mutual funds with quicken accounts. How many vanguard quicken accounts are there in your account bar on the left of your quicken home page? If you right click, edit on one and go to the online services tab, what type of connection does it show, i.e. direct connect,or express web connect? Looking at all your posts in this discussion, it seems to me the desires you've expressed are somewhat contradictory. "How do I add new mutual funds to Quicken and keep them seperate from the other funds within that account number". That is contradictory to wanting to "setup the new Quicken account". But you "keep them separate" by identifying each security as different from every other security; not by assigning every security to a separate "account". Quicken makes it easy to identify individual securities (one way: Investing Security List > Add Security). Generally, any Quicken "investment" account can hold as many "securities as you like (just as real-world "investment accounts" can. It is simple to hold multiple "securities" in a single Quicken "investment" account ... and the way most investment accounts work in the real-world. And it seems that is the way Quicken has been working for you ... up until your most recent mutual fund ("security") acquisition. 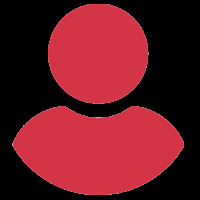 For that, you posted: "My problem is that I added a new mutual fund account to Quicken. If you wanted the newly acquired mutual fund to be recorded in your existing Quicken Vanguard investment account, why would you have "added a new mutual fund account to Quicken"? You needed to tell Quicken that the download of the new "security" (the new "mutual fund") belonged in your existing Quicken Vanguard account. My Vanguard account only has Vanguard mutual funds - so not sure if the industry migration to everyone having everything avail in one accoount is the problem, and therefore maybe having a legacy "mutual fund only" account and another recent "brokerage" account - Is this the convoluted scenario ? I don't know how to explain my problem any better. You all may stop committing on this post. Thanks you. ok... let's go back with some details - and we need to keep the wording correct. It looks like with Vanguard you can have multiple "accounts" that all appear under your Vanguard logon ID. And then of course you can have various holdings within each of those accounts, maybe even the same security across various Vanguard accounts. So ... please describe again - what you have with Vanguard, how Quicken is currently setup to reflect those holdings, and what you are attempting to accomplish now. Here is what is going on because I had forgotten that I actually had that same situation many moons ago. Back then, Vanguard would assign a fund-account number such as 30-xxxxx or 45-yyyy., i.e. a separate account for each fund. But then they stopped doing that, instead adding them to one of the existing accounts. Since they are different account numbers quicken puts them in separate brokerage accounts, which is what the OP had and was therefore expecting to continue. Then when he bought a new fund zz, Vanguard assigned the new fund to the same account number as one of his earlier funds, zz-yyyy which then gets downloaded to that same yyyy quicken account. Best thing to do is just leave things as they are and accept the fact that from a Quicken point of view, he now has 3 Vanguard brokerage accounts. As he makes future purchases, Vanguard will likely add them to that new account. If he wanted to keep that new fund separate for some tracking purpose, etc. he could use the goals feature of Quicken to differentiate it from the other fund(s) within that same account. I did a search I could not find the goals feature. Help!? @JRJ if this an unrelated question, you should start a new post. If it is, please describe what you mean by goals feature. Ah, I see. I know of Savings Goals, but not sure what @Bob L is referring to. You can assign “goals” to securities by editing the security and then clicking other info. Then these goals are available to filter many of the reports,and group by goal on some. Bob L said:...... If he wanted to keep that new fund separate for some tracking purpose, etc. he could use the goals feature of Quicken to differentiate it from the other fund(s) within that same account. I was addressing what I felt could possibly be the reason he did not want new purchases being added to an existing brokerage account. So it is not a new topic as evidenced by the interest expressed by the OP.